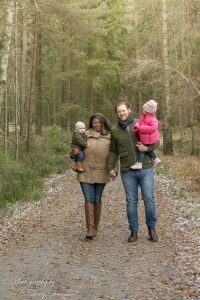 On a very crisp afternoon I met a lovely family who braved the cold to enjoy a family photo session in a forrest dusted with freshly fallen snow. The snow continued to flutter down during the shoot with the tinniest of snowflakes. There was some lovely moments with pappa and his youngest child – his son who just turned six months. There were lots of smiles with pappa lifting him up in the air! Mamma and her little daughter had fun skipping along the forrest path together and afterwards had some nice cuddles together. We had to move inside for a little as it was just too cold out for the children, so I finished off the session with some more intimate photos of mamma and her precious baby son and also her loving daughter in their lovely home. The little brother and sister had a chance to show me their little personalities without freezing and what a joy it was to capture some of these special moments of them together.